Flipping through the channels after debate coverage, i stumbled on Fox News (unfortunately) when I saw Mr. Met hanging out in the background. 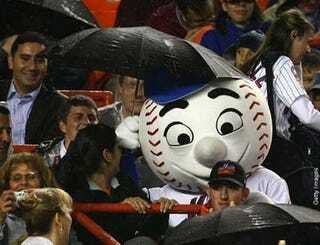 Being a big Mets fan, I thought, "cool, Mr. Met is out hanging at Hofstra." I watched for another minute only to then see the horror of his live decapitation on tv and actually screamed out loud. I hope there were no children watching. I recorded the horror and put up on youtube. Please share so the world can learn from this tragedy." Guys... Last night, as Greta Van Susteren was recapping the Gr8 Deb8... who comes sauntering through the backdrop? None other than Mr. Met!! 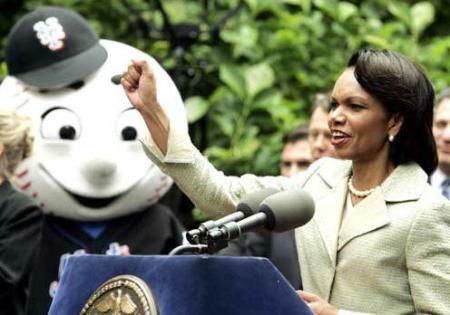 For about ten to fifteen minutes, Mr. Met sauntered about in the background while Greta and guests dissected the Obama-McCain battle.